A great coming of age movie that tells the story of four boys on a mission. There’s a reason why this movie has stood the test of time and is considered a classic. 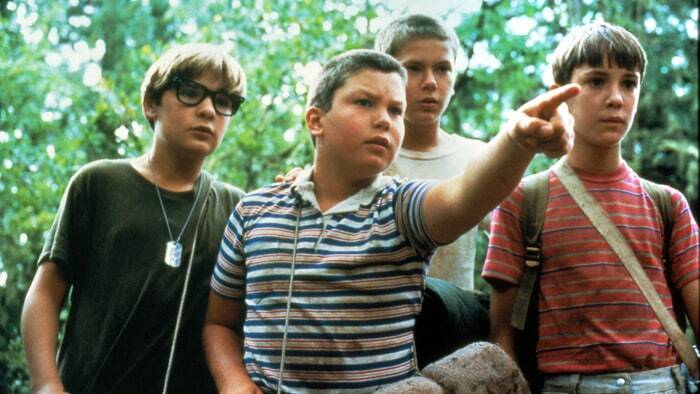 It’s an eighties movie about kids dealing with hardships while having an adventure out in the woods. Consider it the more serious and dramatic version of the Goonies. This one is features actors like Corey Haim, Kiefer Sutherland, and John Cusack, all iconic eighties actors who were representative of that time. And the story on hand here take a group of boys (all of them about thirteen years old,) out into the wilderness, searching for a dead body. One of the members of their group overheard the news that the body was out there, and these boys are on a mission to get to it first. We watch them take on all sorts of challenges, from a speeding train, to leeches, to a gang of threatening bullies. And the story takes us through it all, while developing the characters in such a way that they are all memorable and interesting. 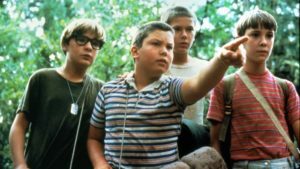 Stand By Me is a movie from the eighties that has easily become a classic. And it’s not very hard to see why. It’s about kids going out and seeking an adventure, while at the same time dealing with real and dark issues about their own lives. This is a film from the Corey Feldman – Corey Haim era where movies about teenagers was all the rage. From The Goonies to The Lost Boys to Toy Soldiers to License to Drive, these kids might have been teen heart throbs, but they actually turned out to also make some pretty great films. And Stand By Me might be the most serious of the bunch. It’s a movie that only features one of those two actors, (Corey Feldman,) but it’s the fact that the film came out in a time when these movies were actually taken seriously, (you don’t see these kinds of movies made today.) The kids aren’t high schoolers. They are about twelve. They have a tree house and sing funny songs, filled with insults. They have conversations about who would win in a fight, Might Mouse or Superman. All that kind of immature kid stuff. They have a secret knock that you have to remember in order to get into the treehouse. And when one of these kids happens to be under the porch looking for something, when two older kids are talking about a dead body they came across, it starts everyone off on an adventure. The kid who was under the porch was Vern, an overweight young man who ends up being the punching-bag of jokes for the group. He’s the one with the least confidence of the bunch, and the one they give a hard time to about letting him into the treehouse. When he starts telling a story, they all start singing over him, and continue doing it until they are finally ready to listen. Vern was under that porch when these two high school kids were talking about a car they stole, and how as they drove off they came across a dead body. It was the body of a boy who has been missing for weeks now. The whole town has been concerned about the missing boy, looking for answers about where he is and what happened to him. Vern and his friends decide to go out to find the body and get those answers. They aren’t old enough to drive, and don’t have a car, so they decide to walk to the spot of the body. In doing so, they have about a two day hike ahead of them. The hike isn’t up the side of a mountain or through wilderness or anything, but it is through the woods, often in areas where they need to camp out, or walk through dangerous things. The most memorable of these is a pond, where the boys swim across and come out covered in leeches. But there’s also a great train crossing scene, with the boys making a jump to escape death. The walk and challenges the boys face is only part of what makes this movie special. Another part is composed of the internal issues that each boy is dealing with. Gordie, (Will Wheaton,) is the star. He’s the straight man of the group, meaning the one who is right down the middle. He’s not as hard and damaged as his friend, Chris, (The bad boy of the group,) or as crazy as Teddy, or even as weak as Vern. Instead, Gordy is the quiet, sensitive type who might actually be the scariest of all. He’s scary because unlike his friends, Gordie is keeping everything inside, and might be emotionally disturbed. He’s also got quite a lot that he’s dealing with at home. His older brother, Denny (John Cusack,) was the town’s local high school football hero, and also the only one who ever understood him. And Denny was recently killed. His parents are still grieving, and in doing so, they all but ignore Gordy. One thing made perfectly clear is that Denny was the favorite. While we’ve seen this idea about how the son who was the favorite has died, and now the parents resent the kid who survived because he’s not as good as his brother-situation before, (Ordinary People,) here it’s a little different. You see, in that movie it made up the entire film. Here, it is but one small part. And unlike that movie, in this one we actually get to see Denny, through flashbacks, which goes a long way. It’s as if Stephen King, (the writer of this movie,) said what if we took that idea from Ordinary People and added to it, to flesh out more about who this character, Denny, was and what the boys’ relationship was all about. As it happens, Denny was more like a father to Gordy than his real father ever was. The other kids in the group have issues too. Chris comes from a bad family where the reputation of who he is proceeds him, everywhere he goes. His father and brothers have done some bad things, and everyone looks at Chris as if he has too. At one point he tells a story about how he stole something, and people didn’t know it was him, but they accused him anyway, based on his family. Chris did steal the item, but what he’s upset about is the fact that everyone knew he stole it, or just assumed he did. And Teddy has a father who is insane. People in the town know it and laugh at Teddy because of this, despite the fact that his father fought for this country in Vietnam and was once a hero. Vern’s problem is simply that he is overweight and bullied because of it. The kids who give this bunch the hardest time are a pack of older high school kids. Kiefer Sutherland plays Ace, the leader of the group, which includes Chris’ older brother, Eyeball. Ace and his friends are a bunch of bullies, and early on they run into our kids outside of a store. Ace ends up taking the hat that was given to Gordy by his brother, Denny, and is really the most meaningful thing he’s got from Denny. We never see that hat again. But it’s two of the kids in this group who are the ones that found the body and speak about it loud enough for Vern to hear, when he’s under the porch. We spend the movie following the group of kids on their adventure through the woods, but every so often we check in with the gang and see them slowly uncover the fact that two of the members know about the body and are keeping it a secret. This leads to the group finding out, and going after the body themselves. Everyone wants to be the town hero who found this dead kid. The movie takes place in the fifties and is filled with music of the era that you can imagine was playing on radio stations. Songs like “Lollipop,” “Yakkity Yak,” “Everyday,” and “Great Balls of Fire.” We’ve heard these songs before, but put into this context, it feels a little different. Here, you can picture that these were the youthful and rebellious songs that were considered popular by kids at the time, as they played over the radio. And aside from that whole fifties feel, the movie is also cemented in place by a voice over from an older Gordy, played by Richard Dreyfus, who is looking back over the whole thing. It works as a sort of prologue and epilogue to the film and helps make us think that this wasn’t a typical story about the boys, but instead a story about a summer (and really just two days,) that the boys would never forget. 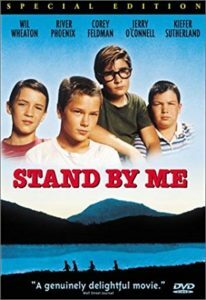 Stand By Me definitely earns a place alongside the other movies of its time. The Goonies was about finding a pirate ship. This one is about finding a dead body. Clearly this is the more serious movie, and that’s probably why its held in such high regard. And that acclaim is well-deserved. Not only is the cast superb (including great 80s icons like Kiefer Sutherland and John Cusack,) but the story makes time for the little moments, all in the interest of keeping our attention. We get a short story, for example, about a pie eating contest and the guy who wins it, but doesn’t feel so good afterwards. This story might not have anything to do with the plot or advancing it in any way, but it’s still entertaining and that’s why it stays in the movie and works. This is a pretty powerful movie.